My regular teens seem to really enjoy destroying old books when we do crafts. My most popular crafternoon to date was a hollowed book. I guess it seems taboo to them, being in the library and all. Since they love cutting up books so much, I’ve been trying to think of a new upcycle craft for them. Before I took over teen programs, I made a paperback wallet for a friend for their birthday and he loved it. It seems like the perfect project for our teens. I tweaked the process a little to incorporate another teen favorite (duct tape) and to simplify it. Paperbacks – $0, I plan to use recently weeded items. Duct tape – $0, still have lots on hand from another crafternoon. Adhesive Velcro – $0, more leftovers. Scissors – $0, a library programmer’s pantry necessity. Pens – $0, we’re going use some from the stockpile of promotional pens. Total Supply Costs: $0!!!! My favorite kind of craft is the craft that uses up all my leftover supplies (the director loves that, too). If I had to guestimate the cost of supplies if you don’t have leftovers, I would say $20-30 for approximately 10 teens. Just depends on where you shop and the brands you purchase (tip: always go off-brand). Total Craft Time: 30-45 minutes. 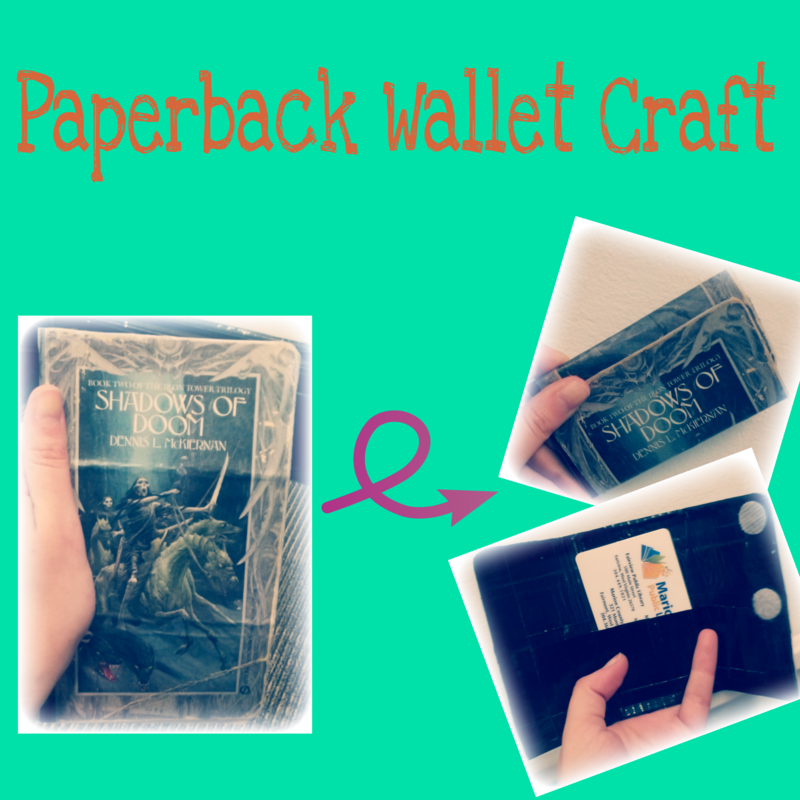 Here are the Paperback Wallet instructions. I’ve been trying to hold our Sharpie Mug Teen Crafternoon for three months now. Each month, the event had to be cancelled due to snow. SO. SICK. OF. SNOW. Anyway, I’ve rescheduled it again. Hopefully, Mother Nature doesn’t ruin another perfectly fantastic teen program. 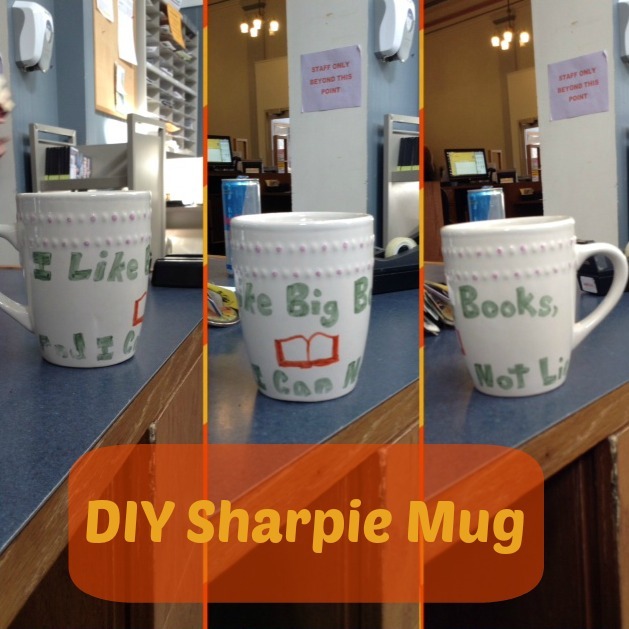 The Sharpie mug is an easy and cheap craft (my favorite kind of craft). Sharpies – $0, we already have a ton of the markers at our library for various craft purposes. I suppose, if you’re flush with cash, you could shell out the extra moola for actual ceramic Sharpies. I probably could have done that, but I’m all about keeping the Benjamins. Oven – $0. Luckily, our library has a working oven already installed in it. If yours doesn’t, I suggest borrowing a bunch of toaster ovens from coworkers and/or friends. Total Craft Time: 45- 60 minutes for decorating and then baking the mugs. Here are the Sharpie Mug instructions. Another event that had to be rescheduled, was a tour for an after-school girls group. The plan was to have a tour of the physical library, then a quick tour of the virtual branch (aka, our website and relevant digital resources), then do a quick craft. This event has also been rescheduled for next week. 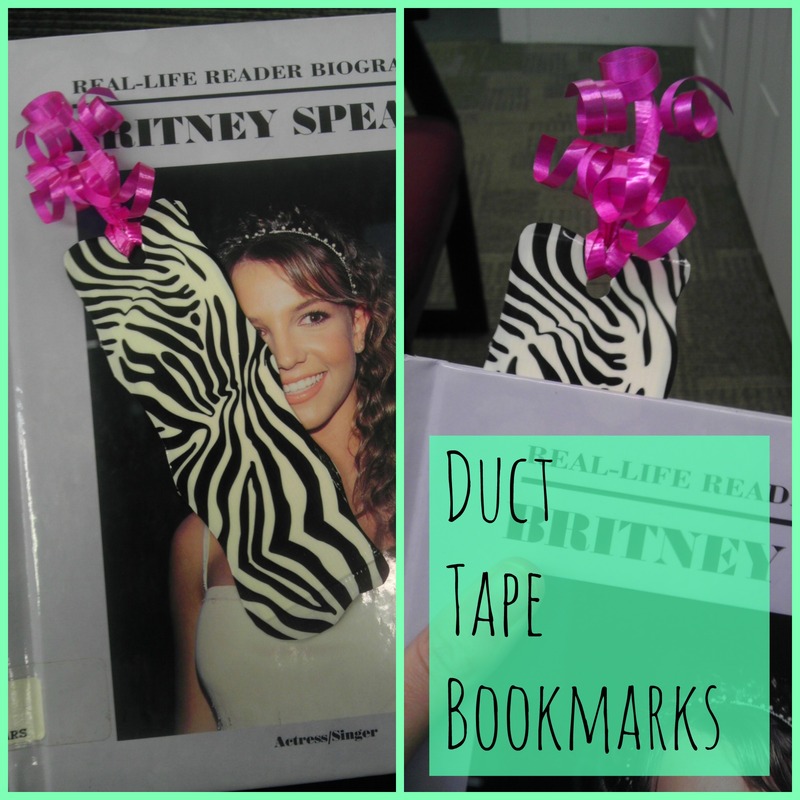 The craft planned is really the quickest craft ever: duct tape bookmarks. Card stock – $0. We’ve got lots leftover from old scrap-booking programs. Duct tape – $0. Again, program leftovers. Scissors – $0. What library doesn’t have 15-20 pairs of scissors lying around? Hole punches – $0. See above. Ribbon – $0. Thanks to our Adult Programmer, for always having craft leftovers that I can steal. Craft time – 10-20 minutes. It took me about 5 minutes, but with a large group it always takes longer than expected. Here are the Duct Tape Bookmark instructions. This month, the Awesome Readers’ Club is discussing Emily the Strange: The Lost Days. 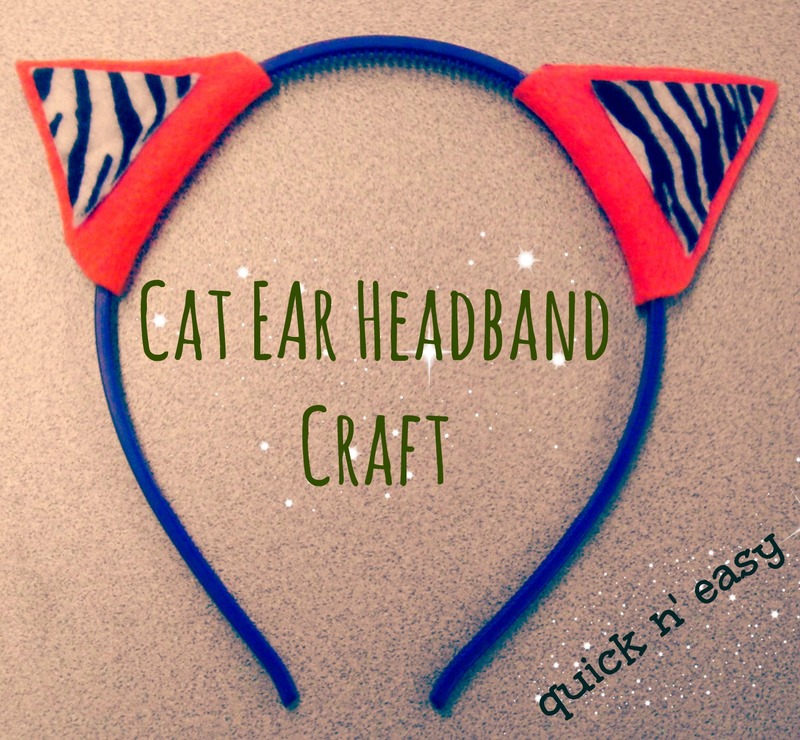 To go along with our discussion, we’re making cat ear headbands. Emily loves cats and dons her own set of cat ears in some of the illustrations (though not as colorful as mine, I’m more of a Molly than an Emily). The teens haven’t actually made it yet, but they did see me wearing the example and thought it was awesome. Once again, this craft was super-cheap. Frugality is one of my better qualities as a librarian. Scissors – Zilch, I already had ’em. Felt – Zilch again. I had felt leftover from a cassette wallet craft. Markers – Nada. A good YA librarian always has sharpies handy. Active time: 15 – 20 minutes. Quick n’ easy.